Lord, we are again grieved by the massive loss of life caused by people’s selfishness (and perhaps desperation). We are disgusted that people continue to illegally tap gasoline pipelines, while knowing that this type of behavior leads to explosions. Today we pray for central Mexico, where at least 67 people were killed and at least 75 injured Friday, due to a major explosion. Please be with the injured as they fight for their lives and well-being. Please be with the grieving as they process this senseless loss of precious loved ones. 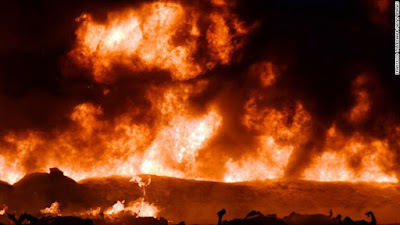 We do pray for confirmation of the cause of this explosion. If the suspected illegal rupturing is confirmed, we pray for the thieves to be caught. And, Lord, we pray for effectiveness as the Mexican government tries to prevent the continuation of this behavior, even in the midst of a time when gasoline is not always easy to find. We pray for the conviction of the Holy Spirit upon those tempted to damage the pipelines for their own purposes. Remind them of the loss of lives; help them understand that it one day could be their own loved ones destroyed by this recklessness. We pray against this type of behavior in Jesus’ name. Amen.